Discover the most comfortable floating lounge chair ever made! The SunChaser Luxury Floating Pool Lounger's super soft yet durable SunSoft fabric combined with the adjustable inflatable cushion provides you with head to toe support. The moulded pontoon frame keeps you stable in the water, and with 2 built-in cup holders, you may never want to leave your pool. This spa Cover Guard is extremely strong, waterproof and designed to work in all climates. Protect your expensive insulating cover from tree sap, ice, snow, harsh rain and intense sun. A 12-inch skirt is included and features an elastic hem for easy install. Canadian Spa Company hot tub and spa covers provide unbeatable quality at an affordable price. Canadian Spa Company covers are made from the strongest marine grade vinyl in the industry to withstand the harsh winter months and are both UV and mildew resistant. 4 re-enforced handles are built in at convenient points for carrying your spa cover and for simple cover removal. Adding to this support are 6 locking straps which fasten to the tub which are ideal for locations with lots of wind. The extra-thick 5 in/3 in insulating foam inside the cover is vacuum sealed with a 6 mil double coated polyethylene vapour barrier to increase the longevity of the cover and retain water temperature within the spa. For additional support, a metal C channel is added at the centre of each foam insert. Our cover includes an extra thick, full-length steam seal inside the fold to trap any excess heat that would escape through the side of the cover and minimize heat loss. Canadian Spa Company hot tub and spa covers provide unbeatable quality at an affordable price. Our covers are made from the strongest marine grade vinyl in the industry to withstand the harsh winter months and are both UV and mildew resistant. 6 re-enforced handles are built in at convenient points for carrying your spa cover and for simple cover removal. Adding to this support are 8 locking straps which fasten to the corners of the tub which are ideal for locations with lots of wind. The extra-thick 5 in/3 in insulating foam inside the cover is vacuum sealed with a 6 mil double coated polyethylene vapour barrier to increase the longevity of the cover and retain water temperature within the spa. For additional support, a metal C channel is added at the centre of each foam insert. Our cover includes an extra thick full-length steam seal inside the fold to trap any excess heat that would escape through the side of the cover and minimize heat loss. 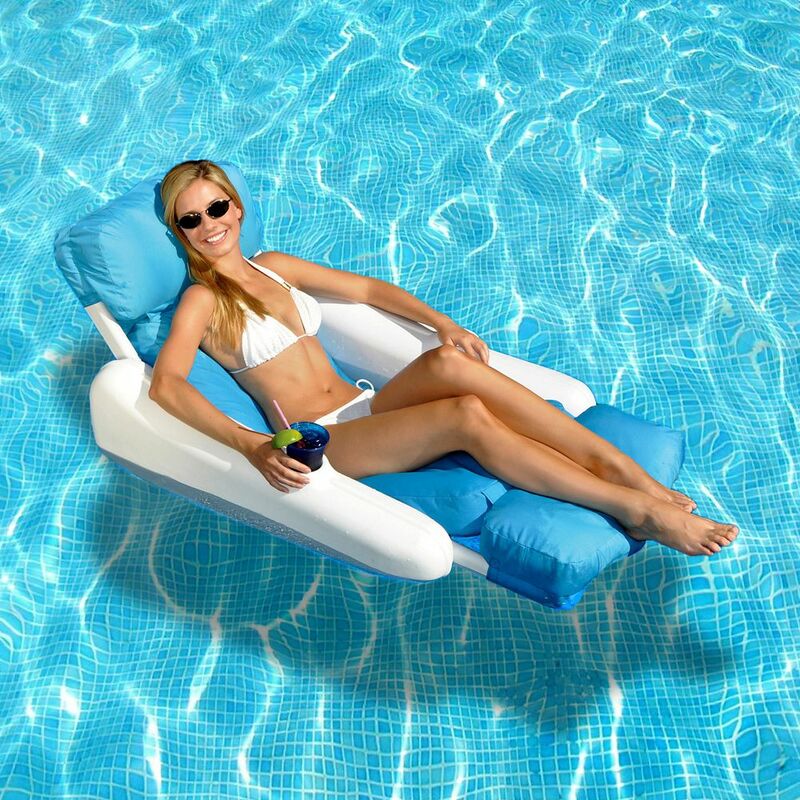 SunChaser Luxury Floating Pool Lounger with Sunsoft Fabric Covering Discover the most comfortable floating lounge chair ever made! The SunChaser Luxury Floating Pool Lounger's super soft yet durable SunSoft fabric combined with the adjustable inflatable cushion provides you with head to toe support. The moulded pontoon frame keeps you stable in the water, and with 2 built-in cup holders, you may never want to leave your pool. SunChaser Luxury Floating Pool Lounger with Sunsoft Fabric Covering is rated 2.0 out of 5 by 2. Rated 3 out of 5 by Jose from It was easy to assemble but it is not the... It was easy to assemble but it is not the easiest chair to get into once it's in the water! Rated 1 out of 5 by Nancy from do not like it covers slide off The chairs were not so easy to assemble but once together and trying to use them, the cover for the head wants to slide off and so does the bottom at the foot area. Just not secure at all.